Summary: 11 athletes in different sports are profiled. Each one had a very difficult childhood. 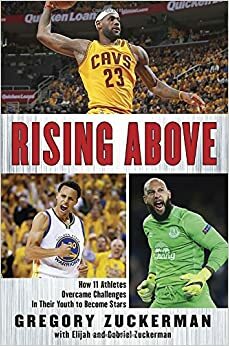 Tim Howard was diagnosed with OCD and Tourette’s at age 10; Dwayne Wade grew up in poverty with a drug-addicted mother; coach Jacques Demers was so traumatized by his abusive father that he never learned to read or write. Yet each one made a decision at some point to work hard and stay positive, and this led to a successful and lucrative sports career. An afterword explains how the author came to write the book, inspired and assisted by his two sons. 256 pages; grades 3-7. Pros: The stories are fast-paced and fun to read, as well as extremely inspiring. The trials that each athlete faced are pretty severe, yet their positive attitudes and hard work are the common threads running through each narrative. Cons: Only one woman was profiled, Althea Gibson whose career was in the 1950’s, unlike the more contemporary male athletes. Also, there were no pictures.